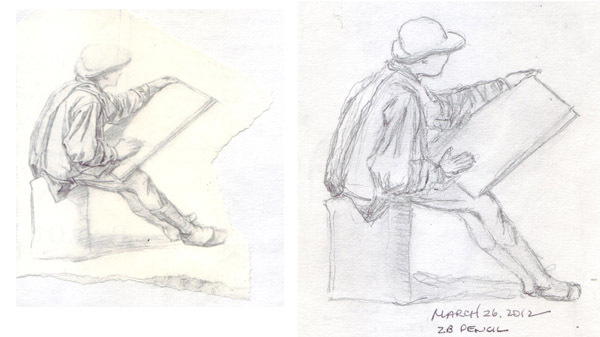 This was an unusual week for Sketchcrawls with my NYC Artist friends. April 13: Pat, Benedicte, Melly, and I gallery-hopped in Chelsea - each picking out 1-2 galleries to peruse. Gwen Diehn was supposed to join us, but she had a foot problem and rescheduled our day together after the weekend. We loved an Adolph Gottlieb monograph at Pace Gallery (but not the more recent paintings of bursts) and decided to get together to learn more about his pictographs and to play with and extend his techniques. 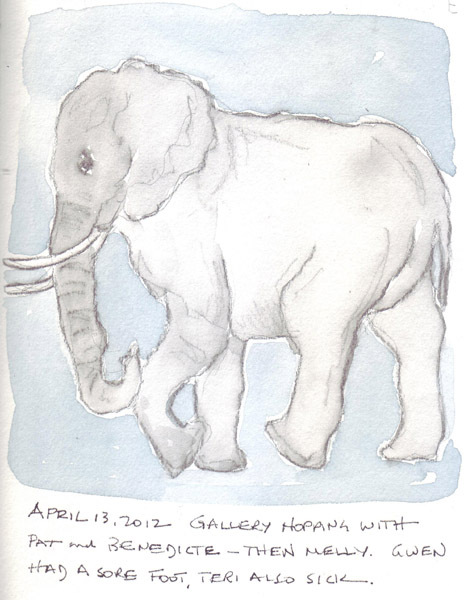 I loved the huge B & W Nick Brandt African animal photos at Hasted Kraeutler Gallery and stayed behind to sketch several of his elephants. You can see 23 of the photos here. April 16: We took Gwen on her first walk on the Highline - and after lunch found a beautiful place to sit, talk, and sketch. This is the first time we saw Gwen since the publication of her new book - The Complete Decorated Journal: a Compendium of Journaling Techniques - which is an expanded combination of her Decorated Page and Decorated Journal. Pat, Benedicte, Melly, and I are 4 of the new Artist Profiles added to the book. 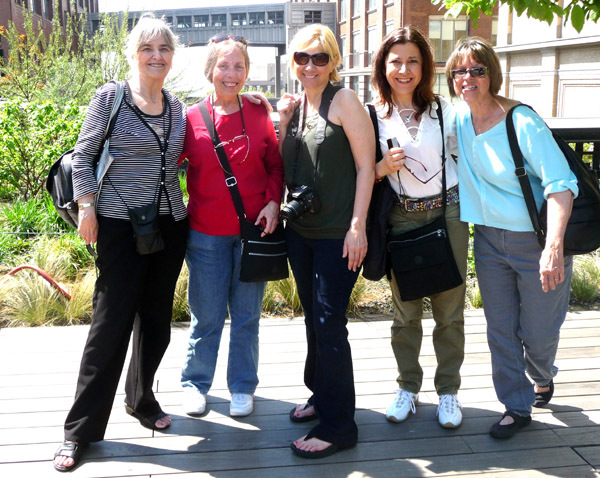 Here is a photo of me, Pat, Teri, Benedicte, and Gwen. 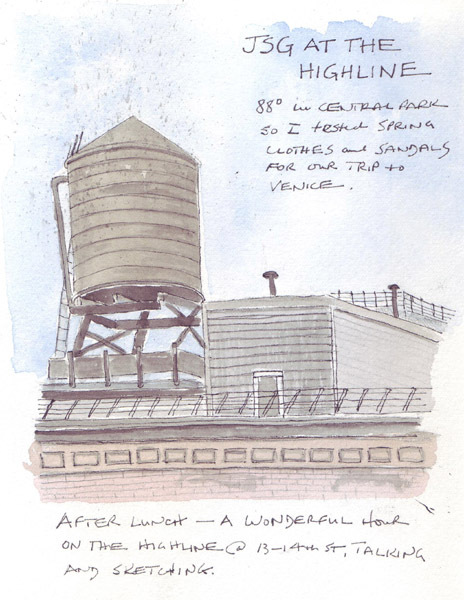 Pat, Gwen and I sketched the same roofline with a quintessential NYC water tower. 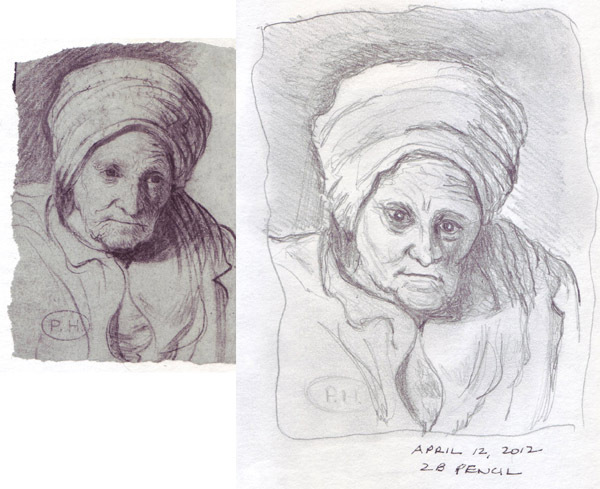 April 18: Judy, Pat, Benedicte and I met for brunch and the tours of the Whitney collection. My friend Gail was the docent for the 3rd Floor tour of the Biennial, but we also dropped into tours by other docents on floors 5 and 2. 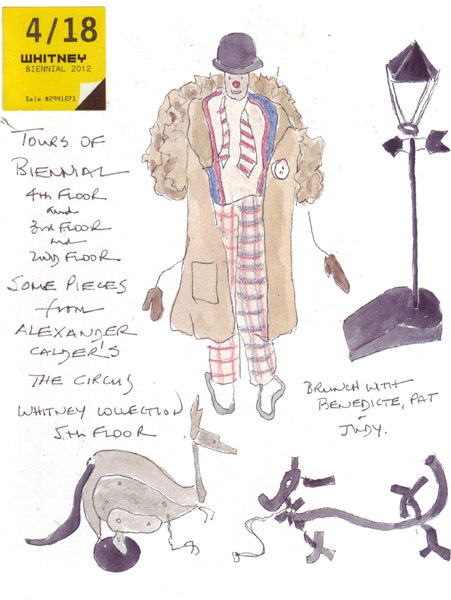 While waiting for the tour to start, I sketched several Alexander Calder figures from his massive piece called The Circus which is currently on display on the 5th floor. The link only shows a small portion of this piece. I love having local friends with similar interests - both art on paper and textiles. And as I've said before, I would never have met most of them without connecting through our blogs. 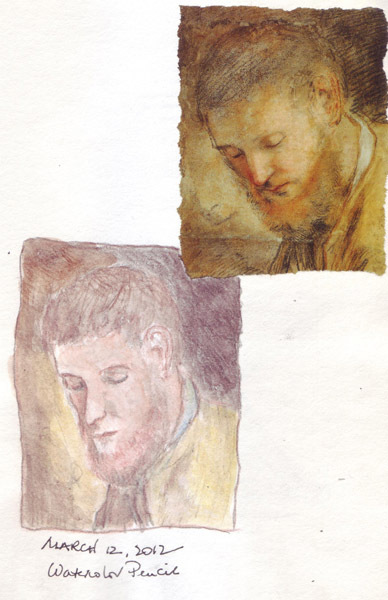 There are periodic projects re: daily sketching on the websites/blogs that I follow. 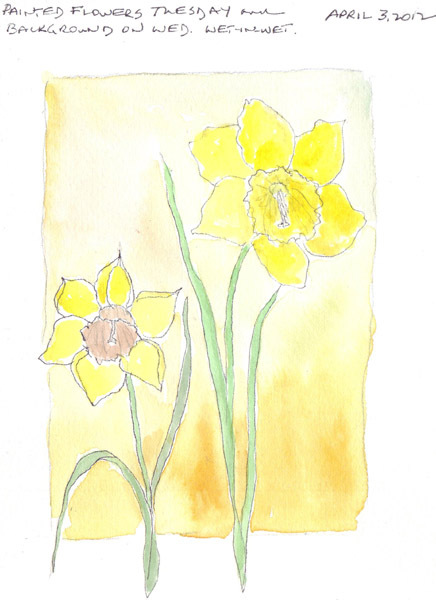 As a new Everyday Matters (EDM) online art group member, (Jan 2006) I committed to drawing/painting daily as a method to improve my skills and continue to learn. 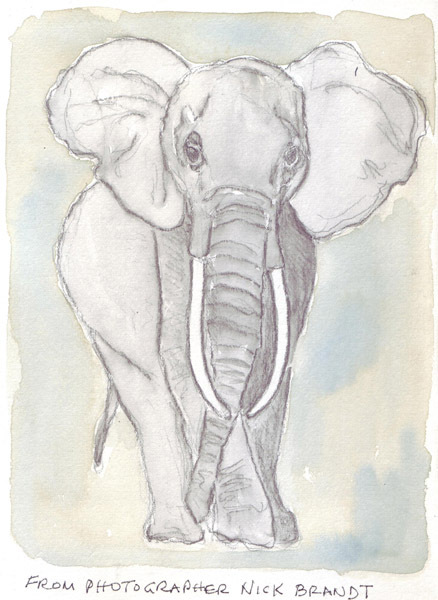 While it was a wonderful decision, and I now have a big body of work and many wonderful memories captured in sketches in a big row of sketchbooks on my shelf, sometimes it is hard to decide what to draw on otherwise uneventful days. I sketched so many things in my apartment, that I sometimes wander around trying to get inspired. This week, a blog post of a fellow EDM member, was all about this lack of inspiration as she commits to 365 days of drawing. Readers of this blog may remember that I was obsessed with the Museum of Modern Art Print Studio from late January through early March this year, and created small pamphlet bound collage books each time that I was there. You can see those blogposts here and here. On the last afternoon I was there, I sorted through my leftover copies from the Reanimation Library and collected all of the unused figure drawings. I made a book I called "Draw Me" and then used it at home for figure drawing practice. 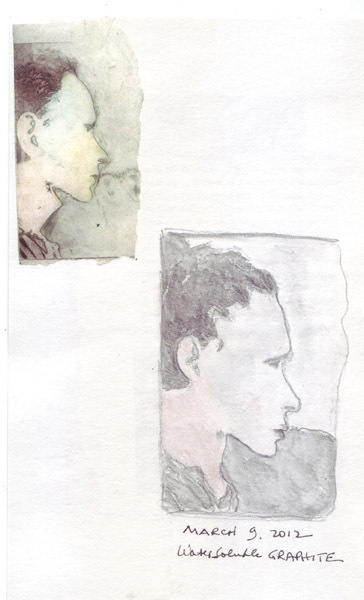 Then I selected unused artists' drawings of people and glued them on pages in a another "Draw Me" book that I will eventually bind with a pamphlet stitch. 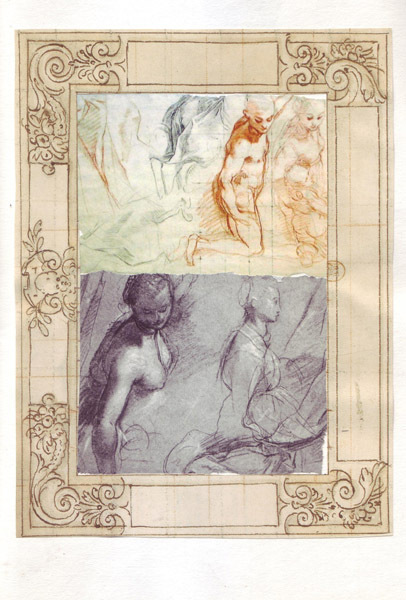 I keep this booklet near my drawing space and now I have some wonderful drawings/paintings that I can try to recreate to improve my own art skills. Unfortunately, I have no information about the original artists - most of these were book illustrations without attribution. I doodled alot when I was a student in middle school and high school. And then I stopped almost completely. 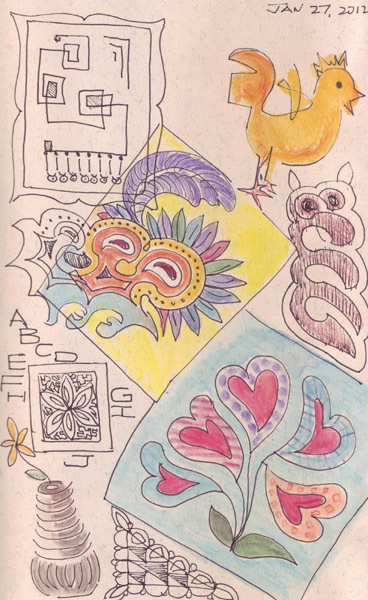 After that I drew images for my children, or for applique quilt patterns, but rarely did I just fill up pages with random spontaneous doodles. I'm sure that it is a wonderful creative technique and I'm fascinated enough by recent discoveries in neuroscience to realize that filling up parts of my brain with these random images must have some effect on creativity in general. I'm reading Jonah Lehrer's new book, Imagine: How Creativity Works, which is all about the newest neuroscience data on creativity and especially "aha" moments. 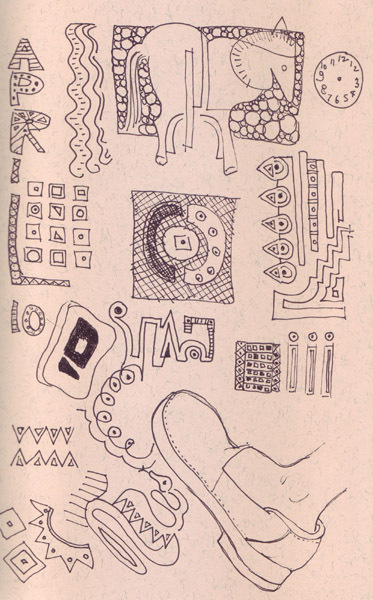 This makes me wonder what is really happening in my brain as I pay more attention to doodling sessions. I visit my Mother weekly at her retirement complex and during the cold weather we take long walks inside the complex and sit for an hour talking. I now carry a doodle sketchbook and a dozen watercolor pencils and either sketch what I see, or just fill a page with doodles. I use an old, previously unused spiral journal with toned paper - and never think about wasting paper. I couldn't do this freely on good watercolor paper. 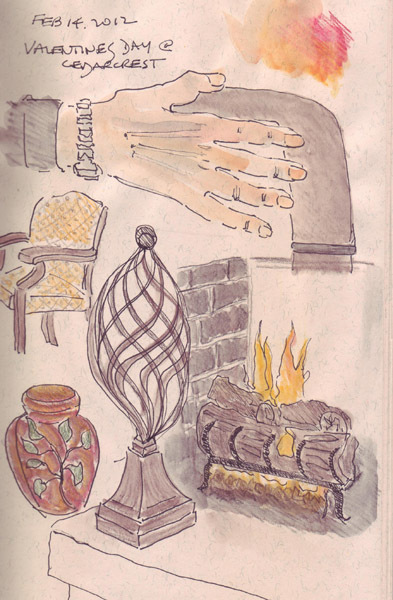 This page was done on a cold winter day - sitting in front of a fireplace. These next 3 were done by spontaneously doodling. 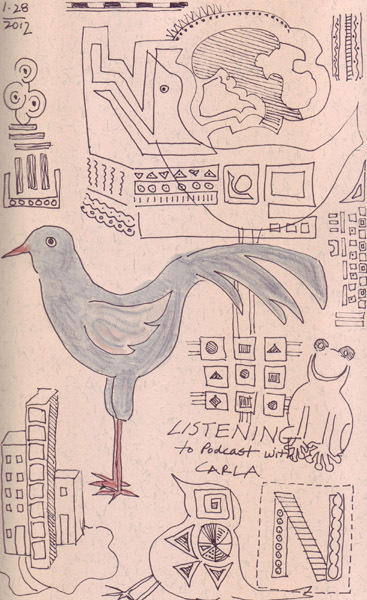 I have no idea why there are birds on almost every page (I just uploaded 3 of many weekly pages in my journal). I am not a bird lover and only draw sea gulls when we are walking on the beach. 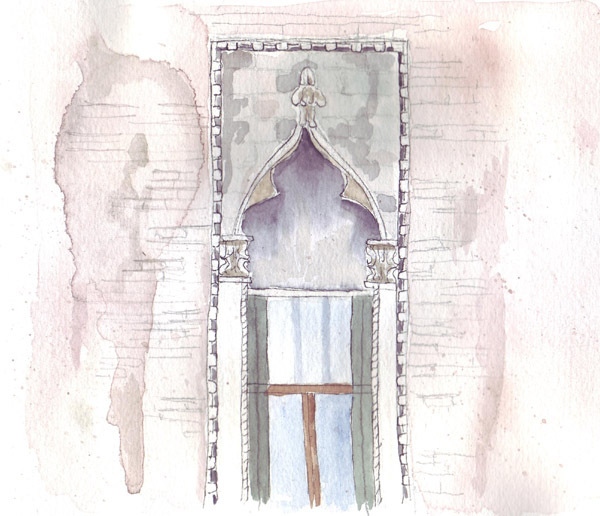 I'm still sketching Venice scenes from my old photos in anticipation of our upcoming trip to Venice. Painting canal water and showing the texture/decay of building surfaces are scarey to me, so I worked on both of those watercolor painting skills in these two paintings. 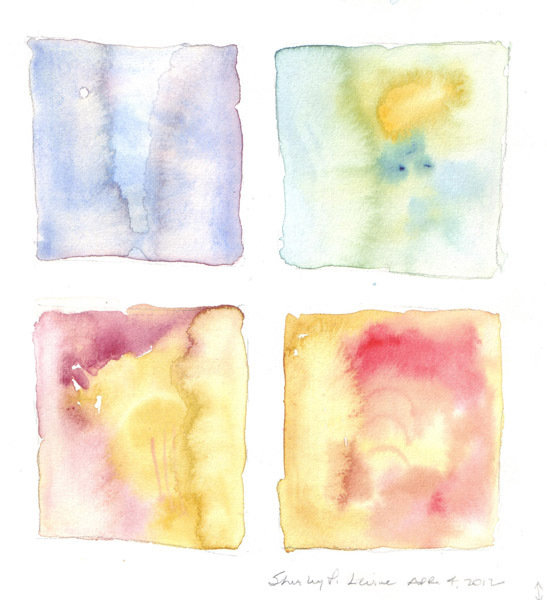 I started this project with two 30 inch strips of watercolor paper that I folded into accordion booklets. Since I didn't carry any image over the folds, I'm now planning to cut each strip into two folios and bind these sketches into a small book with 4 folios and 16 pages. This will be the first time that I sketch/paint first and bind into a book later. I may decide that it is the perfect method for travel sketching. 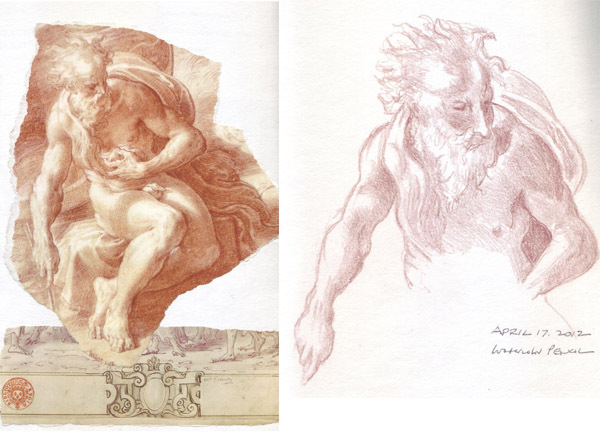 The first 4 sketches and the accordion booklet can be seen here. There is a huge amount that I don't know about painting with watercolor and I periodically try to play with some techniques to improve my skills. This week I scanned the book Wet On Wet Watercolor Painting by Ewa Karpinska and then painted - flooding my 140 lb watercolor paper with water. Here are the 4 samples - each made by dropping in two colors while the surface was very wet. I loved tilting the paper and watching the pigment flow. As the paper dried, I added a few paint lines and tried to mop up a little color. 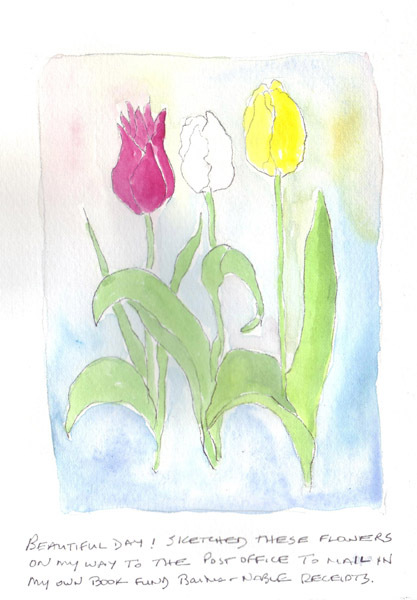 New York street planters are filled with Spring flowers this month and I sketched tulips and daffodils while walking to the post office. I painted the flowers and let them dry overnight. The following day I thoroughly wet the backgrounds with water and dropped in a few colors. I really enjoyed the lack of control painting with very wet paper and will continue to explore how to use more water to achieve effects I want. 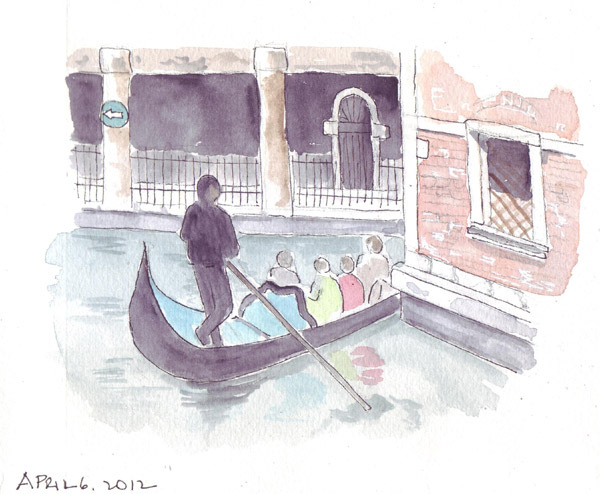 Next: Time to paint canal water in Venice for practice!